Calgary Greencrete is Calgary's concrete finishing expert, providing residential and commercial concrete services for both indoor and outdoor uses. Our vast selection of stamps, variety of exposed aggregate finishes, and acid etching for irregular colours and textures ensures the highest quality of work for your property. We're driven to provide sound solutions to get the job done. Our longevity is attributed to our never-ending commitment to excellent workmanship and outstanding customer service. Smooth Finish (Garages & Basements) - Generally intended for indoor use, this finish is often utilized in garages and basements. Exposed Finish (All colors and styles) - Colourful rocks are embedded in the concrete mix. Once the concrete is poured and has set for a number of hours, the top layer is washed off, exposing the aggregate, or gravel, in the mix. 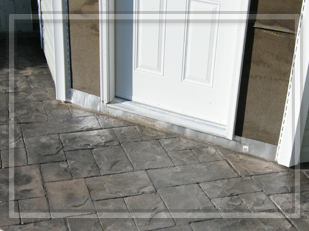 Stamped Finish (Different patterns and colors) - Used to pattern, texture, or emboss concrete to resemble brick, slate, flagstone, stone, tile, wood, and various other patterns and textures. Various patterns and colours available. Broom Finish (Driveways & Sidewalks) - Traditional finish seen on most sidewalks and driveways. In addition to the services listed above, we also offer breaking, demolition, and hauling of previous unwanted concrete slabs. Whether you're looking to accent your driveway, add some aesthetic appeal to your backyard with a concrete patio, or add a simple sidewalk to your property, Calgary Greencrete's outdoor concrete will always provide satisfaction. Let Calgary Greencrete, your Calgary concrete finishers, create your dream.